Size Table Small = Waist 28-29 inch Medium= Waist 30-31 inch Large = Waist 32-33 inch X-Large = Waist 34-35 inch 2X-Large = Waist 36-37 inch 3X-Large = Waist 38-39 inch Sieayd specialized in professonal gym apparel, is committed to provide the most innovative and price-friendly sport goods. Improve your performance in all sports and physical activities! Material wicks sweat & dries really fast, Quick-dryingtechnology evaporates moisture fast. Flat lock seams to prevent friction, good crease resistance, not easy to deformation. 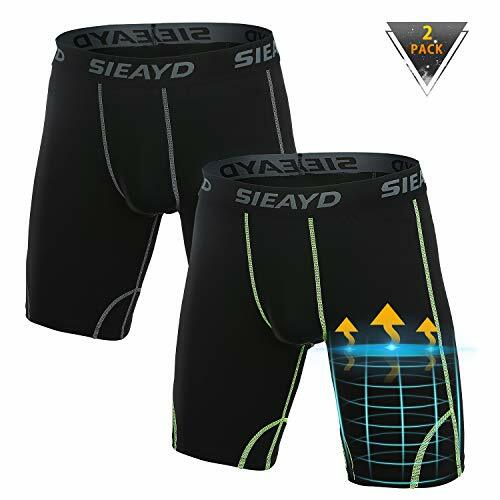 These compression shorts are perfect for all kinds of sports indoors or outdoors, for example running, basketball, football, baseball and so on. Comfortable to wear： Polyester 85%, Spandex 15% / Cool in Summer and Heat retention in Winter.